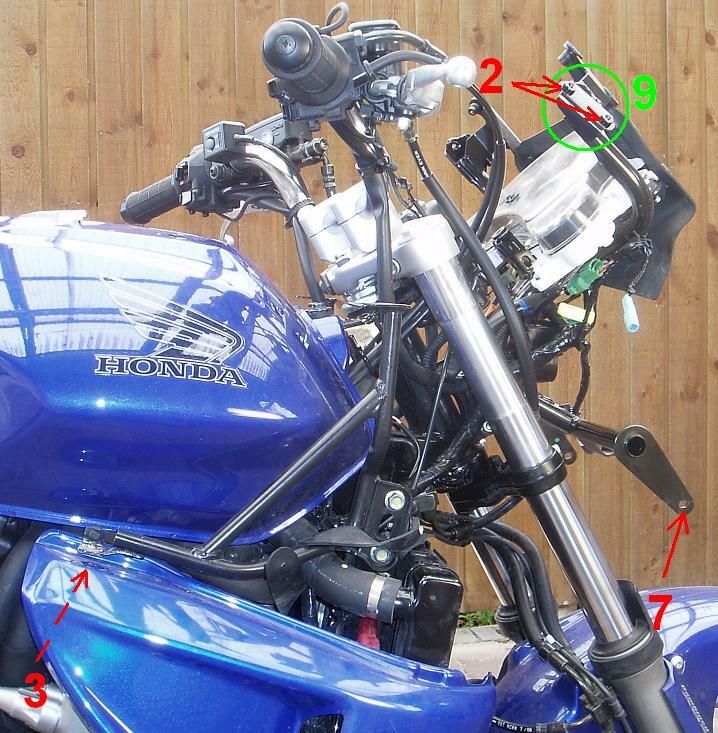 This page describes how to remove and reinstall cowlings (also called fairings) on a 2007 CBF1000A Honda motorcycle and is applicable for 2006 to 2009 models. 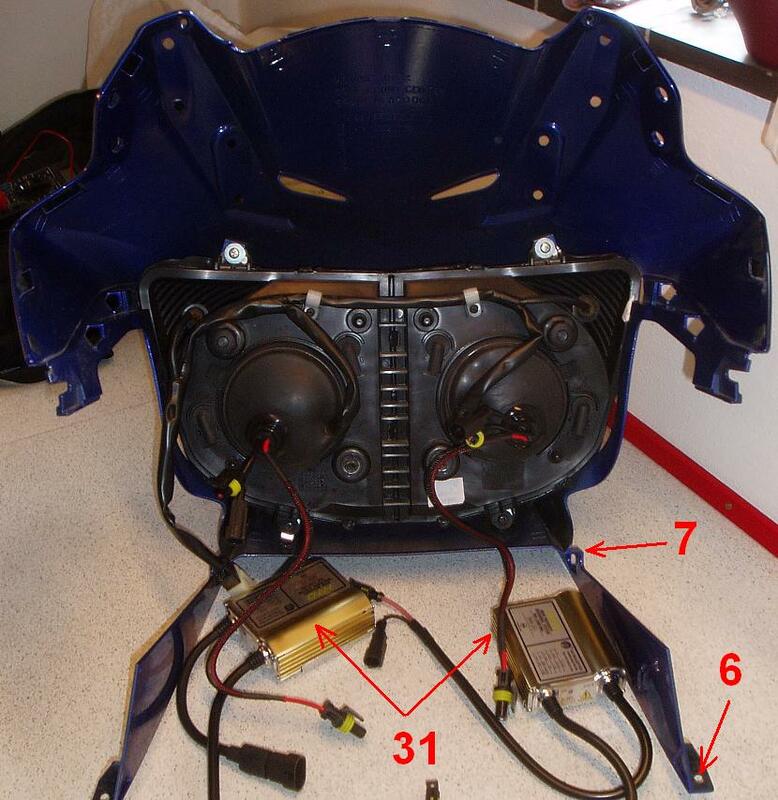 This comprices the upper right cowl, the upper left cowl, the meter panel, the left and right side panels and the front center cowl including the headlight unit. 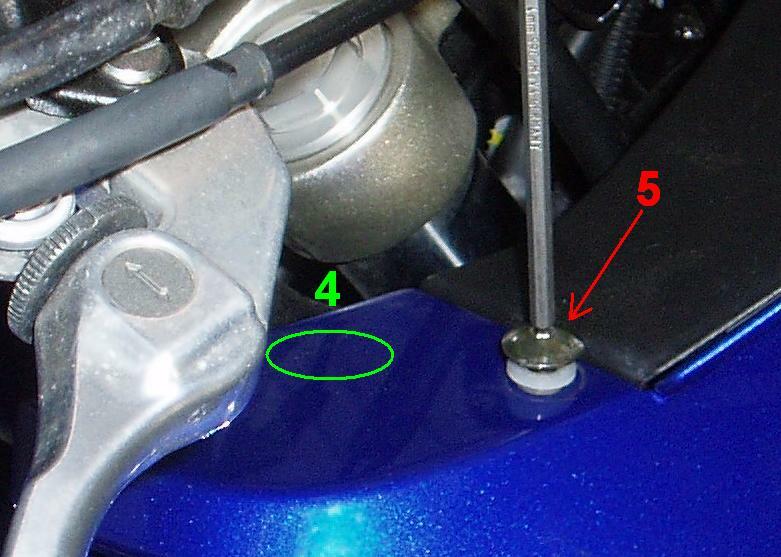 To remove the right cowl, first remove the bolts (3, 5, 7) and the plastic clip (red 6). Observe that there is a plastic spacer at screw (5). Also notice the nuts at (3) and (5). You may want to remove these also so that they are not accidentially lost while doing other service work. To remove the left cowl just follow the same principles as for the right one. 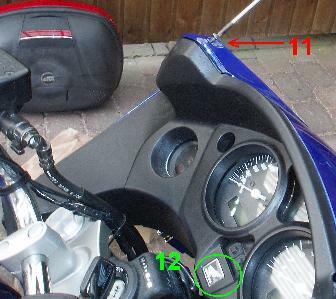 To remove the front center cowl including the headlight unit, start with removing the windshield (1) as described here and then remove the mirrors by unscrewing the two bolts at each mirror (2). On each side of the meter panel there is a small triangular "inner panel" which must be removed by taking of the trim clip which keeps it in position. The inner panels are not shown on the images but they are situated under (4). Remove the meter panel by first removing the two screws (11) and then pulling upwards at the center (12) to disengage the boss which is hidden below. You will find that it requires quite a some brute force to release it. The entire front center cowl (above right) including the headlights can now be removed by releasing it from the mounting bosses at the upper corners (9) and pulling it forward. 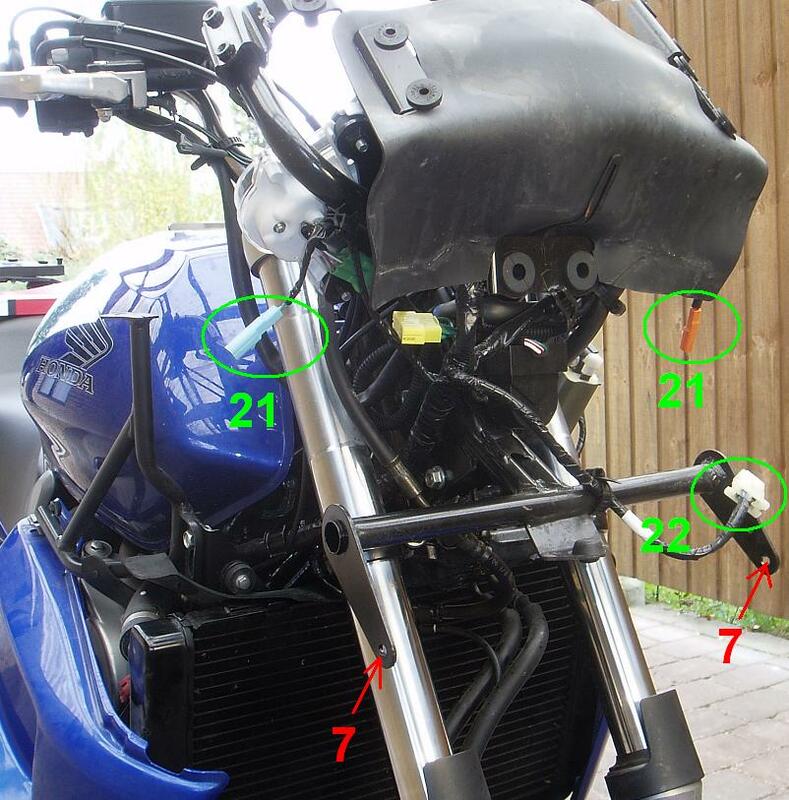 When it has come loose you just need to disconnect the headlight connector (22) and the whole front center cowl can be removed from the bike. In this case it was taken off for installation of a HID Xenon light system. You may read more about this here. 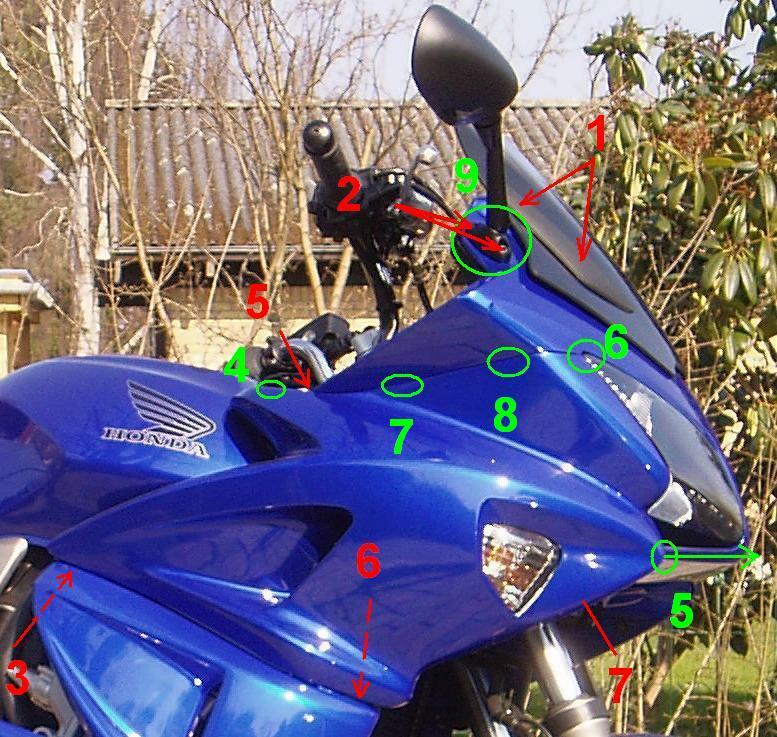 The two images below show how the "naked" bike looks. 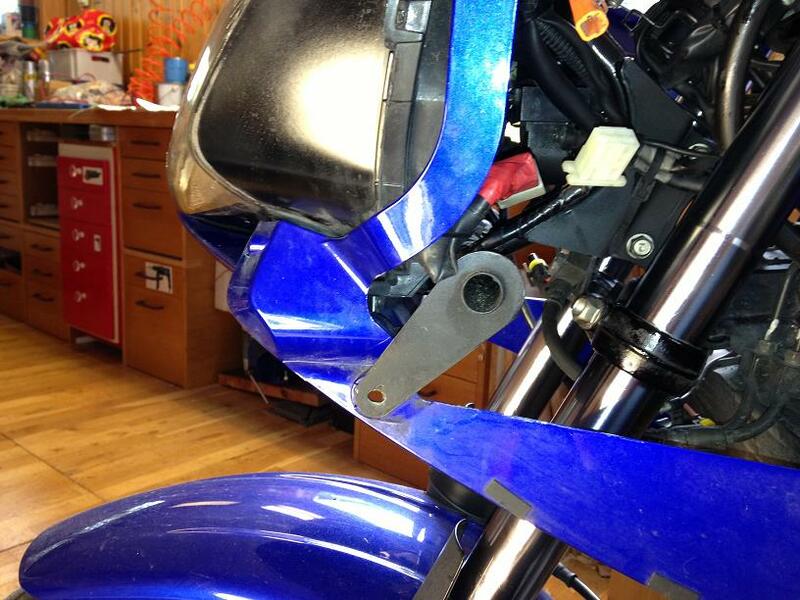 Installling the cowls again is simply to reverse the removal procedure. 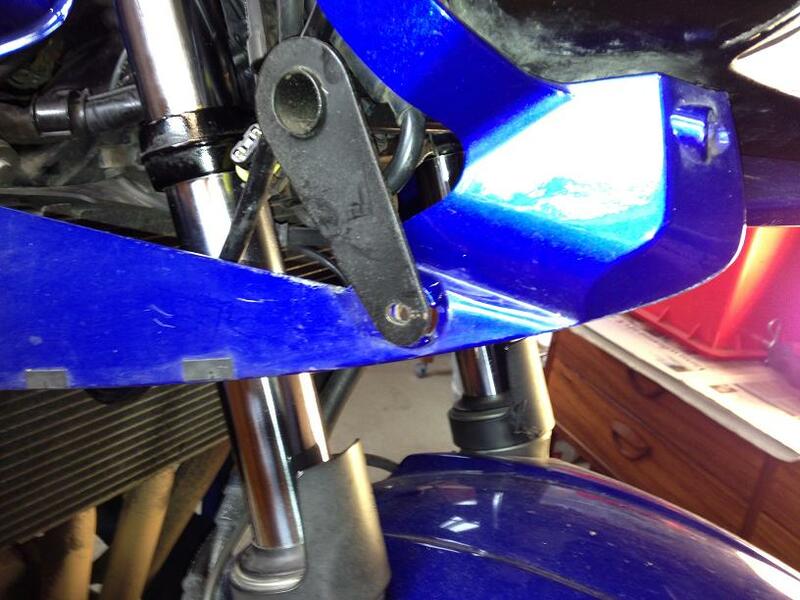 The two images below show how the holes (7) shall be alligned with the mounting brackets. In case the plastic clip (6) has been damaged during removal (that happened for me) you can instead use a plastic strip. That will in fact do a much better job.